Each branch and sub-branch worships its own tutelary kami and that in turn protects its devotees. On the eve of Hohza, a ritual is performed to put souls to rest. KAKUTOH are wooden pillars erected for victims ; such as of war or natural disasters of all ages., in opening-up of lands, etc. The KAKUTOH Matsuri is a religious service for all souls enshrined there. The date differs by each branch. 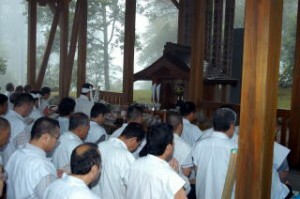 Recognizing the Ryujin as a divine spirit, we perform a thanksgiving ritual once a month. Its date differs at each branch and sub-branch. Inari is the kami of food, clothing, housing and all blessings under the sun. Furthermore kami of Inari are divine spirits which work for blessing and for developing our teachings. Inari Matsuri is the time to give thanks for all our blessings. It is performed on every Horse Day of a month. 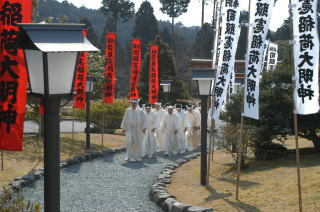 (Note) Matsuri is a ritual where we give thanks for the bounty of Nature and worship with offerings for the prosperity of communities. In addition, on every 8th of every month, we worship the founder, and the first president at the end of each month.